Recent decades have seen a dramatic curtailing of hard won civil liberties. These restrictions have been inadvertently cushioned by the expansion of the internet and the ability to exercise some of these rights by proxy on the web. Today we look at the scale of the civil liberties confiscations. "Web blocking is an extreme response. The orders are often indefinite and open ended, and will be blocking legitimate uses. The BPI and the courts need to slow down and be very careful about this approach. "The BPI seem to be trying to speed things up and that is not good. It will lead to carelessness and unneeded harms. "As an approach, censorship is a bad idea. It leads to more censorship, and is unlikely to solve the problem it seeks to address. The Network for Police Monitoring (Netpol) have launched a campaign to limit the gathering of data by the police on political protest. The campaign, don't be on a database, encourages protesters to assert their legal rights to keep their personal details private. 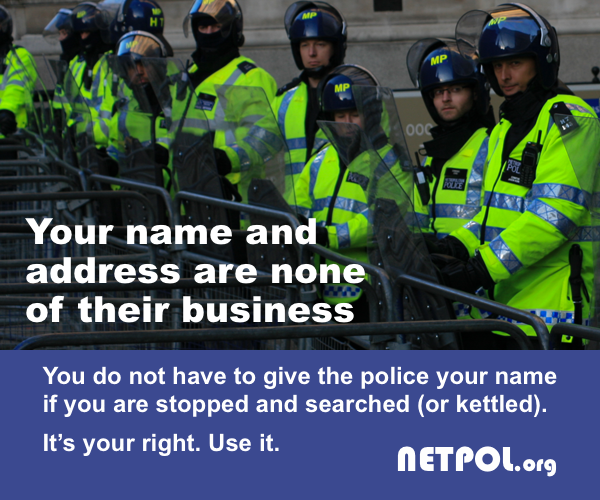 The campaign includes a series of posters and flyers with the words, 'Your name and address are none of their business'. Suppose if I were a bus driver, out on my rounds, driving drunk and recklessly and somewhere along the line there was a dreadful fatal collision. The next morning I agreed to give a written statement but absolutely refused to meet the investigators of the crash, refusing to tell them, in person, my version of events. Furthermore, what would you think if my wilful unaccountable silence was known about yet decidedly not reported and positively glazed over in the media when reporting on the event? Police Misconduct has been the subject of great debate recently. Drs Mawby and Wright of Keele University provide an excellent summary of police accountability . Their document gives us all an excellent overview of a subject we [ the public] know little about. Many may believe that police accountability is not relevant to them but it is important to understand that the public get the quality of service they fight for. Emergencies can happen at any time, day or night - to anyone. A police officer can make the difference between life and death. It is in everyone's interest to ensure that policing in the UK is proportionate, accountable and done with utmost respect to the civil liberties. The public have a right to expect the highest standards - afterall, it is the tax payer who pays for the UK's policing and pays out compensation for the mistakes made. It is therefore in the interest of the economy to have robust, effective policing not a version of the Wild West. Two more cases collapsed at Highbury Corner Magistrates' Court on Monday, 31 October when police offered no evidence against student demonstrators following the acquittal of a third protestor the previous week. Aaron Peters and Ashok Kumar, both PhD students, had the cases against them dismissed after dramatic video and photo evidence was presented in a related case against Simon Behrman on the Thursday, 27 October. The footage and photos found on the Internet by Kumar's solicitor, Matt Foot, directly contradict the witness statements of six police officers. "Five arrests were instigated by primarily one police officer who basically lied," said Peters in an interview with this writer. ANPR stands for Automatic Number Plate Recognition. The UK has a network of ANPR cameras which can be found on most motorways and main roads, as well as at ports, petrol stations, and in a few cases entirely surrounding the centre of some cities or towns - a so-called 'ring of steel'. Hundreds of privately contracted police officers are working for forces across the country despite being unaccountable to the watchdog responsible for investigating deaths in custody, public complaints and allegations of wrongdoing, an investigation by The Independent has found. The Independent Police Complaints Commission (IPCC) has no automatic power to discipline privately contracted staff even if individual failures or misconduct contribute to the death or serious injury of a detainee. The Government has failed to close this regulatory loophole despite warnings dating back several years. The IPCC has investigated a number of cases in which privately contracted staff were found to be working alongside police officers when a detainee suffered serious harm or death. It was NemesisRepublic who pointed me in the direction of a document by Anna Minton - on the privatisation of public space. We're back online! A server move at the end of last year left us with some weird technical issues, and life left us too busy to fix them, but we finally found the time and here we are - looking forward to publishing your civil liberties news and opinion pieces once more! This site now has over 200 registered users. This site now has over 100 registered users. Just changed our RSS feeds so that URLs are embedded instead of plain text; please let us know if you notice any problems.